Or view larger version. Lobby card from the Hollywood film While Thousands Cheer. 1940. Maker unknown. Promotional piece for film. Collection of Oakland Museum of California. Gift of anonymous donor. This lobby card from the Hollywood film While Thousands Cheer tells us a great deal about the limits placed on African Americans in the fields of sports and entertainment in the segregated America of the 1940s. 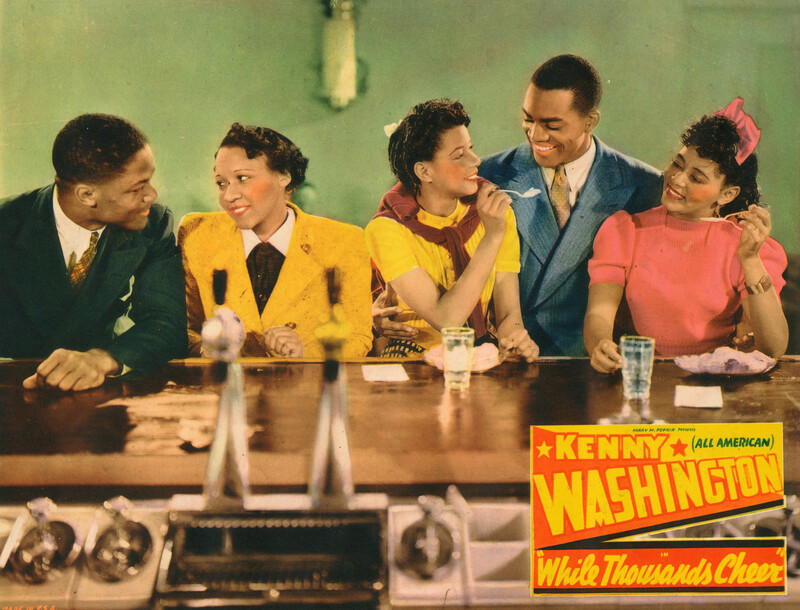 The 1940 film, a so-called "race movie" because of its low budget, nearly all-black cast and an audience producers intended to be nearly exclusively African American, featured football star Kenny Washington, second from right, and actress-dancer Jeni Legon. Washington, the previous year, had concluded an All-American collegiate football career at UCLA, but was not allowed to play in the NFL because the league prohibited blacks from participation. Film roles for blacks were extremely limited as well. Legon is believed to be the only African American female performer under contract to a major studio at the time.